I was wandering around the market on Portobello Road again. Mainly because it was lunch time and the weather is so nice at the moment, but also because I was trying to get some pictures of the market for Kate, as she asked for it a while ago (and I am happy to answer to everybody’s photo requests). Did you know that last week both Posh Spice (Ms. Beckham – and who cares) and Justin Timberlake (am not a major fan, but wouldn’t mind spilling my cup of orange juice on his shirt while I come around the corner with it …) have been spotted walking on the loose on Portobello Road? The pictures I took are not great (taken with my mobile phone), Hugh Grant is not on them, but it gives some sort impression of what it looks like: Notting Hill, Portobello Market on a Friday afternoon in the summer: Portobello Market 1 and number 2. I am not that big a fan of Flickr, but it is very handy to post to with my mobile while I am on the move. And what I do like is that you can plot your pictures on a map. Here is mine. While I was taking those pictures, I stumbled over Love, Actually again. This time I found Love in a carton box, for only £1,50. I am currently in this mode again, because I have one, and maybe even 2 interesting things to tell you, but I am waiting for a confirmation. So you have to wait with me. In the mean time: I hope you’re not completely tired of my Love Actually obession just yet. Because I am afraid there is more to come. 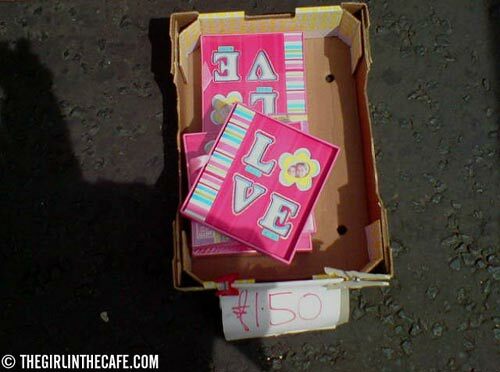 At least this time I won’t ask you if you ever bought love, for 1.50. Yes, well what can I say. I am probably the most impatient person in the world so waiting is torture for me. Especially when it concerns waiting for things that might set me dancing on, i don’t know Billy Mack or so, when they actually turn out to be happening. Tired of Love, Actually? Never. How did I miss this post?? I have now spent a lovely time visiting places that I will likely never see in person. The graffiti is wonderful … I wish there was more of it here, but we have these people who go around painting over it almost as soon as it appears.